The Mega metro train project is going, “to provide safe, fast and eco-friendly rail based mass transit services to the public at affordable rates while simultaneously catalyzing dense and orderly urban, benefitting the people daily commuting between Gandhinagar and Ahmedabad. Saath has been working for the MEGA rehabilitation plan for the PAFs affected due to Metro train project in the month of September, 2015 in one of the depots called Gyaspur depot. The Rehabilitation plan includes relocation of the PAFs to the new EWS site, where they would be allotted 1 BHK flats by MEGA and facilitate in the entire process of resettlement by creating residential management committees and livelihood restoration programme to be conducted by the Nirman team of Saath for 32 trainees. Saath would be facilitating the entire process of Rehabilitation. Saath Livelihood Services (SLS) has intervened to support for the PAF’s resettlement and income restoration. 10 areas of Ahmedabad have been covered as of now. 647 families have been identified and verified for inclusion in Resettlement Action Plan (RAP). Public Consultation Meetings were carried out to understand the concerns of the PAFs. 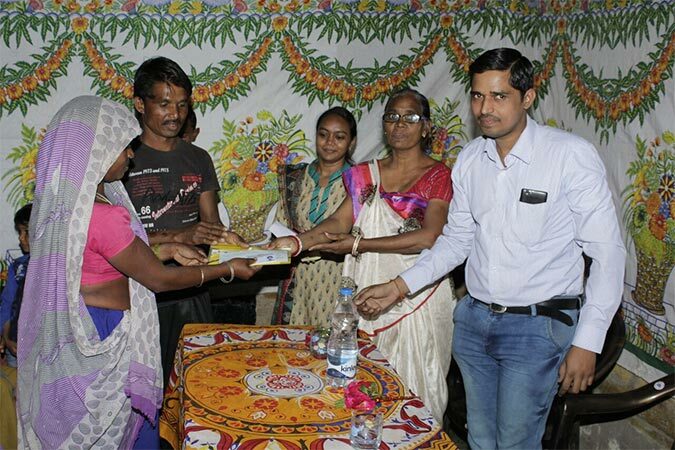 48 families at Gyaspur depot site received Rs. 1,44,000 each in two instalments towards shifting and subsistence allowance. Gradually all PAFs will receive allowances as the project progresses. 48 PAFs of Gyaspur depot site and 62 PAPs of Apparel Park depot site (all NTH) have been recommended for allotment of a house at EWS housing scheme of AMC. The list of PAPs is under scrutiny by MEGA and the PAPs will be allotted the houses by July 2016. SLS team is preparing list of PAPs at other locations for EWS houses. Many Project Affected Persons (PAPs) were affected economically due to shifting as they usually work as construction labourers. 32 members of PAFs of Gyaspur depot site have enrolled for mason training under Nirman programme of Saath and will have better work opportunities on completion.